Thousands of tourists visit the site every year, more than 2000 workers are working in the area, also nearly 200 people returned to their homes after the explosion and are living in the border villages but still those lands are not good for fulfilled life. 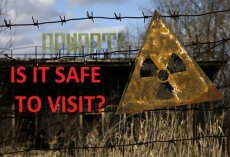 That’s true that you can make tours to Chernobyl and Pripyat, walk freely on the routes showed by your guides and even stay for a few nights in local “Polissia” hostel or hotel "Desiatka". Safe tours are possible because radiation levels in the atmosphere of the Alienation Zone are the same as in any other city of Ukraine or Europe. Only couple of hot spots which still possess dangerous radioactive particles but tourists are not allowed near them. We are getting more ionization from the Chest X-Ray, computer tomography or from transatlantic flight then from walking in the Chernobyl or Pripyat for the whole day. Naturally, there are rules inside the Zone that are set to protect visitors at fullest. It is prohibited to touch, eat or drink local water, berries, fruits, vegetables, grass, moss and any other kind of vegetation here as it is full of dangerous elements. Radiation levels in a surface water are 30 to 50 times higher than the norm, but the most contaminated are underground waters – its irradiation is 1000 times higher than the safe level. Also, it is better to walk on the concrete and not sit or stand on the ground. Every tour guide has a Geiger counter and can easily show you why trees and mosses should be left untouched. Some tourists wear special costumes and masks to be protected from dust and any kind of possible contact with radiation particles but most don’t. Due to rules, it is better to wear clothes that cover hands and legs, no sandals or shorts and t-Shorts are allowed. During the tour, every visitor will be checked twice for radiation on the special checkpoints so that you can be sure not to get radioactive particles with you. Visiting Chernobyl Zone is safe and radiation-free if you listen to your guides and follow the rules. But for sure horizons are not so bright considering the question of resettlement here. Such radioactive isotopes like stroncium-90 will remain dangerous till 2214, cesium-137- till 2314, plutonium-239 - for 24 000 years. That’s why there is no question about people living a normal life here.